Costochondritis is basically the cartilage inflammation that tends to connect your rib to sternum (breastbone), a junction which is known as costosternal joint. Moreover, the pain caused due to costochondritis can mimic of heart attack or similar to some other conditions related to heart. Herbs Solutions By Nature offers the best effective treatment for this disorder named as Chondreton, its regular use proves to treat the disorder in its best possible way. 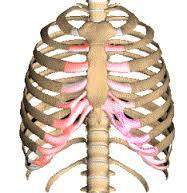 Chest wall pain, costosternalchondrodynia and costosternal syndrome are few other names of costochondritis. When swelling is accompanies with Costochondritis, it is then referred as Tietze syndrome. Tenderness and pain which is linked with costochondritis often affects even more than a rib, occurs on breastbone’s left side, worsens while coughing or taking deep breaths. Many cases of the condition have no obvious cause. However, the condition may result due to injury, physical strain, arthritis, joint infection and tumors. According to the experts of Herbs Solutions By Nature, it mostly occurs in females than men, and in individuals older than forty years of age. During the patient’s physical exam, the doctor feels along the patient’s breastbone for swell and sensitive areas. He may ask the patient to move his arms or rib case in particular ways in order to trigger the symptoms. Costochondritis pain is quite similar to pain associated with lung disease, heart disease, osteoarthritis and gastrointestinal problems. There are no specific imaging or laboratory tests to confirm the diagnosis, however your doctor can order different tests example electrocardiogram or chest X-ray in order to rule out some other conditions. Self measures can help the patient of Costochondritis feel more comfortable. He or she can try over-the-counter pain relievers such as naproxen, acetaminophen and ibuprofen etc, avoid the activities which make their pain worse, try placing the heating pad or a hot compresses to his painful area few times a day. However the heat should be kept on low setting. Although, the prominent cause of the condition is unknown till date, yet there are few evidences regarding the children those carry heavy school bags, particularly on their single shoulders, are at a greater risk of costochondritis. Strenuous exercise, heavy lifting and upper respiratory infections may be also associated to the condition. Certain preventive steps tend to reduce costochondritis risk whilst protect the overall health of you and your family such as use steps in order to avoid respiratory infection, encourage children to properly use their school bags, avoid the physical activities which may trigger the condition. The Treatment of Costochondritis focuses on relieving the pain, few medications your doctor may prescribe you are NSAIDs, Narcotics, antidepressants and anti-seizure drugs. All the mentioned medications have not proved to cure the condition unless relieving the pain temporary. ”Chondreton” offered by Herbs Solutions By Nature is truly the effective and efficient Costochondritis Herbal Treatment, which has successfully proved to treat countless of patients suffering from the condition. It is prepared from hundred percent natural ingredients, thus leaves no point of side effects! Some of the better Costochondritis Natural Remedies include rest, a heat or cold compress, stretches and exercises, improving your posture, and herbal remedies like arnica. The anti-inflammatory costochondritis diet might also help you heal your pain and inflammation in both the short-term and long-term. We will detail the various treatment options, including the best costochondritis diet and some of the better Costochondritis Herbal Remedies natural treatments.